Myatt Snider, driver of the No. 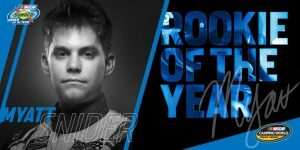 13 ThorSport Racing Ford F-150, secured the 2018 NASCAR Camping World Truck Series Sunoco Racing Rookie of the Year after finishing the season with three top-five and eight top-10 finishes, 55 laps led and an average finish of 14.1 in 23 starts. Earning a third Rookie of the Year title for Sandusky, Ohio-based ThorSport Racing, he joins Willie Allen (2007) and Johnny Sauter (2009), who have earned the title for Duke and Rhonda Thorson in their 23-year history.